Hare seem hard to come by and most of the time I have to make do with rabbit, however the way I cook rabbit is the same as when I cook hare. I always marinade the rabbit before I cook it, perhaps for a shorter time, and the cooking time is reduced significantly especially for farmed rabbits. I have recipes on the blog for cooking rabbit and hare and most of the recipes for cooking chicken can also be used to cook rabbit. This time I took more photos while I was cooking the rabbit with cloves, cinnamon and red wine – you will recognize spices that are characteristic of some Sicilian cooking due to significant influences from the Arabs. I have driven through Licodia Eubea on my way from Piazza Armerina to Calatagirone and then Ragusa but did not take any photos. I have photos from nearby Grammichele with its hexagonal shaped piazza in front of the main church. There is a large unusual sculpture in the middle that is one of the largest sundial in the world. Like in Licodia Eubea there seem to be very few people around and it appeared that we had the town to ourselves. This is a photo of a segmented hare ready to braise. The hare has been sitting in my freezer for about 6 weeks, but because it is very hard to find, I buy when I see it, irrespective of whether I am ready to cook it or not. I chose an Ada Boni recipe for cooking hare in the Piedmontese style (recipe from Italian Regional Cooking, Bonanza Books 1995). Boni’s recipe is slightly different to other Piedmontese style recipes recipes I looked at and it includes cognac; other recipes may also contain any of the following ingredients, for example: cinnamon, garlic, rosemary and juniper berries. 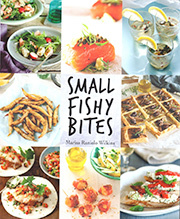 I use recipes as a guide and I alter quantities and ingredients to suit my tastes. I like spices and herbs and increased the quantities; I prefer and used fresh herbs rather than the dry suggested in the recipe. Both Barolo and Barbera are wines of Piedmont and understandably Boni suggests using Barbera for the marinade wine, but I used a good quality Australian red wine and chose to drink the Italian. Chocolate smooths out the sauce and I used a greater amount than suggested and rather than adding 4 teaspoons of sugar I added very little sugar; I like using stock and added some to the braising liquid. I have not used Ada Boni’s words, but the procedure for preparing the hare is more or less what she suggests. In Australia I have yet to purchase a hare with its liver, heart, little alone its blood – these are used to thicken the sauce towards the end of cooking. Interestingly enough, Alex the small friend in the photograph is now very much grown up. Use an earthenware bowl for the marinade and a heavy bottomed saucepan with a well sealing lid to braise the hare. Being a Piedmontese recipe, plain polenta makes a good accompaniment. Chop one onion, carrots and celery and put them in an earthenware bowl with the segmented pieces of hare. Add the herbs cloves and peppercorns and a little salt. Cover with the win and let it marinate for 2-3 days in the fridge. Drain the hare (take the pieces from the marinade and drain them) and then drain the vegetables separately. Keep the wine for cooking the hare. Heat oil, lardo and butter and brown the hare pieces – use high heat. Remove the hare from the pan and any juices. Add the onion to the same pan and sauté it gently in a little oil. Add the drained vegetables and sauté these for a few minutes. Return the hare (and any juices) to the saucepan, pour in the wine (from the marinade), add a little salt. Make sure that the lid is on tightly. Simmer for about 2-3 hours until the meat is cooked. I also added about 1 cup of stock. Remove the cooked hare and put aside. Remove the bay leaves and if you have used sprigs of herbs remove any of the remaining small sticks (If you can see the pepper corns and cloves remove these as well). Rub the vegetables in the sauce through a sieve, use a mouli or blend the vegetables in the sauce. Return the sauce to the saucepan, stir in chocolate, add the hare and taste the sauce – if you think it needs a little sugar add this. Add the cognac last of all (I only used about 2 tablespoons). One of my favourite ways to cook rabbit or hare is with chocolate; chicken can also be cooked in the same way but is less common. If it is chicken it will cook in a relatively short time, a rabbit will take longer and a hare will take much longer – I cooked hare and it took close to three hours to cook. There are several Spanish and South American recipes where chocolate is used in savoury dishes so the chocolate does not need to be considered unfeasible – Spaniards ruled Sicily over long periods. Those of you who have been to eastern Sicily may have noticed the Baroque architecture that is especially prevalent in this part of Sicily and you may have visited Modica, the centre for Sicilian chocolate; this is where the recipe is said to have its roots. 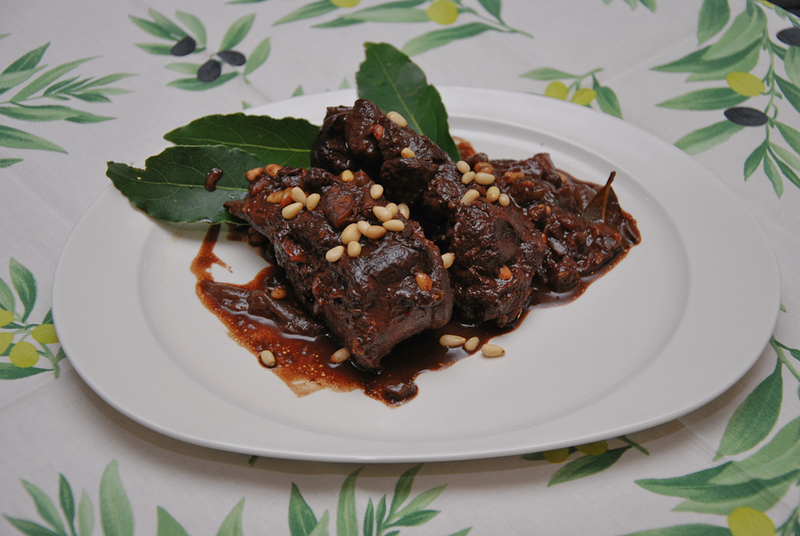 In this Sicilian recipe the rabbit (or hare) is cooked in the same way as alla stemperata (in all stemperata dishes the ingredients include celery, carrots, onions, vinegar, sugar, raisins or sultanas, pine nuts, green olives and capers) but fennel seeds and cloves replace the last two ingredients and finally dark chocolate is used to enrich and thicken the sauce. 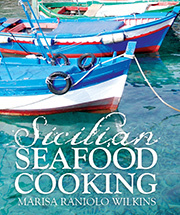 The flavours in the stemperata have been partly accredited to the Arabs and are characteristic of much of Sicilian cuisine. Hare, like all game benefits from marinading in wine before cooking. I do this when I am cooking rabbit as well, but there is no need to marinate chicken. I always save some of the leftover cooked hare and sauce for a pasta dish – use ribbon pasta, e.g. tagliatelle or pappardelle. Whenever I buy hare I remember butcher shops in Italy where each beast is often left with a part of its body to make it recognizable – the head or the foreleg complete with fur, hoof, claw or paw. Clean the hare or rabbit or chicken and cut it into manageable sections at the joints. Marinate it in the wine and half of the quantity of the oil and bay leaves for at least 3 hours and turn it occasionally (if cooking chicken you could marinade it for 1 hour if you wish). Remove the pieces of meat and drain well; keep the marinade for cooking. Add the rest of extra virgin olive oil in a large frying pan and sauté the pieces until golden. Remove them and set aside. Add the onions, carrots and celery to the same pan and sauté until soft but not coloured. Reduce the heat, and add the wine marinade, bay leaves, fennel seeds and cloves, the seasoning and vinegar. Cover with a lid and simmer it gently until it is soft – the time will vary as it depends on the meat. For example farmed rabbit will cook in a little time ( 40-60 minutes, the same as chicken, whereas a wild rabbit could take 2-3 hours).You may need to add some water periodically as it cooks so that it does not dry out (this has always been my experience). Add the sultanas or raisins, pine nuts and chocolate about 30 minutes before it is cooked Remove the lid and evaporate the juices if necessary. My relative Corrado lives in Ragusa and he tells me that it is the Feast of San Giorgio (the patron saint of Ragusa). There are always large festivities for this yearly event and celebrated in Ragusa Ibla on the last Sunday in May. and Corrado and Barbara will take advantage of the warm weather and ride their vespa. There is no need for me to describe this event because I found a fabulous little film on YouTube (check link). Naturally I am always interested in the food, but Corrado disappointed me by telling me that he is not able to tell me what is eaten on these occasions so I will take the opportunity to write about one of my aunt’s favourite ways to cook rabbit:. coniglio a partuisa, a very common way to cook rabbit in this south-eastern part of Sicily. Coniglio alla stemperata is also a local recipe. The foto of the cooked rabbit was taken In Zia Niluzza’s kitchen the last time I was in Sicily. Unfortunately the foto does not do it justice; the taste of the rabbit is exceptionally good. As you can see it is cooked in a heavy frypan to allow the juices to evaporate and caramelise. If it is a wild rabbit, so to remove the wild taste it is usually soaked in water and vinegar for at least an hour before it is cooked. This will also bleach the flesh. To make it more visually appealing, I add fresh mint at the time I present it to the table. 1 rabbit cut into smallish pieces, ½ cup green olives, ½ cup capers, 4 cloves garlic, a few sprigs of mint leaves, 3 bay leaves, 1 glass of red wine mixed with ½ cup of red wine vinegar, ½ cup extra virgin oil, salt and pepper to taste. Extra mint leaves for decoration. In a large frying pan sauté the rabbit in the hot extra virgin olive oil until golden. Add the seasoning, the olives, garlic, capers and mint. Reduce the heat, and add the mixture of wine and vinegar gradually while the rabbit is cooking. If it is a tender rabbit and if it is cut into small enough pieces, the rabbit may be cooked by the time all of the liquid has evaporated. If the rabbit is not as young or as tender as you had hoped, and you feel that it needs to be cooked for longer (this has always been my experience), add a little water, cover with a lid and simmer it gently until it is soft – keep on adding the wine and vinegar. Remove the lid and evaporate the juices. Ensure that the rabbit is that deep golden brown colour when you serve it. Decorate with fresh mint (for appearance and taste). I read your bit about pappardelle. We had pappardelle sulla lepre alla cacciatora at La Pentola dell’Oro in Firenze. It includes cinque cucchiai di aceto rosso ( 5 spoons of red wine vinegar). your recipe which includes five spoons of red vinegar does not surprise me. There are recipes where the hare, rabbit and boar are soaked in water and vinegar before it is cooked to remove the wild taste – my mother always did this with rabbit. It bleached the meat and left some of the taste. I think that Anglo-Australians soaked wild rabbit in salt water. I bought a rabbit at the butcher’s in Greve in December 2008 and was given three parcels, one with the rabbit, the other had the head and the third, the liver – these enrich the sauce. The other variation is the use of herbs – the addition of parsley, sage and rosemary. There is of course the recipe for hare cooked with bitter chocolate. Now there’s a good taste!